Mariners Latest: Mariners Sign Oliver Perez to Minor League Deal! Mariners Sign Oliver Perez to Minor League Deal! Well, after watching Moneyball today and seeing Billy Beane trade guys like Carlos Pena away for statistical analysis, I wonder if Jack Z has subscribed to the Moneyball program. Maybe it was a latenight infomercial that he just couldn't say no to. Who knows, but Jack Z seems to grab a lot of guys that used to be, could be, simply just are not and who may never be. Most of these long shots have not worked out yet, but I think I may like the tactics. Much like Pete Carroll, the Mariners create competition. Eric Wedge is on board and puts it out there every year that everybody has a chance to make the team. Whether that is true or not is still a question that I have. Today, the Mariners signed Oliver Perez to a minor league contract and have given him an invitation to Spring Training. 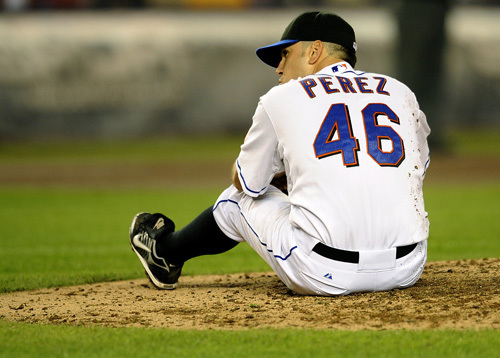 Looking at Perez's stats over the years, he looks like a losing pitcher. He has had a couple of good seasons and spent last year trying to make his year back to a MLB roster with the Mets. So, why? Why is Jack Z even wasting his time? My only guess is because Perez has great "stuff" and if we can do that one thing different we can land on a gold mine for really cheap. Moneyball has given me a new perspective on signings like this. My problem however is that this type of approach never, EVER, works out for the Mariners. Case and point, Casey Kotchman! He never did a thing in Seattle offensively. Last year with Tampa Bay, he became the player that he was supposed to be when he was drafted. I do think that we would have better luck with pitchers than we would with hitters. Either way, it's just another low risk signing that we could only hope has a high reward. We'll just have to wait and see.